BlackBerry OS? Dead! iOS? Dead! Symbian? Never stood a chance. Android's exponential growth has today been illustrated by Nielsen's statisticians who present us with the above chart of recent US smartphone purchases. It shows that over the six months leading up to August 2010, 32 percent of American new phone buyers had grabbed themselves a device with Google's OS on board, which is comfortably ahead of RIM at 26 percent and Apple at 25 percent. These results corroborate NPD's figures on the matter -- which peg Android at 33 percent of new US purchases -- and reiterate the idea that Android is headed to a place whose name starts with D and ends with omination. 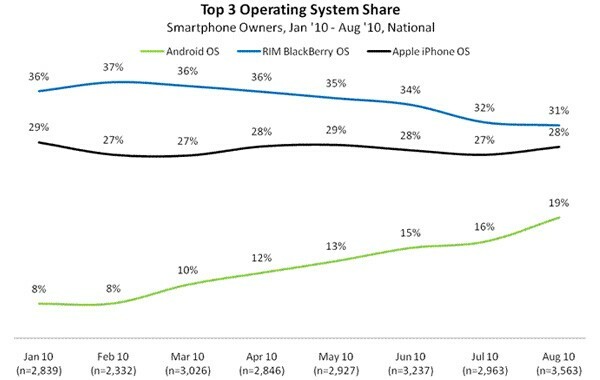 One more chart showing total market share can be found after the break (hint: BlackBerry still reigns supreme overall).